It’s interesting to consider what qualities an actor may bring out in a writer. Back in 2005, Russell T. Davies was lucky to score Christopher Eccleston for the Ninth Doctor role. A serious film actor in the middle of an impressive career, Eccleston came to the show exclusively due to Davies’ reputation as a writer. Davies was forced to bring his A game – not only to give his beloved show a chance, but to meet the demands of his lead. David Tennant, fresh off Casanova, offered his writer an entirely different set of strengths. The two share a taste for melodrama and a flair for the ridiculous, and it shows in the three seasons they worked together. Serious storytelling took second place to showmanship and fun. 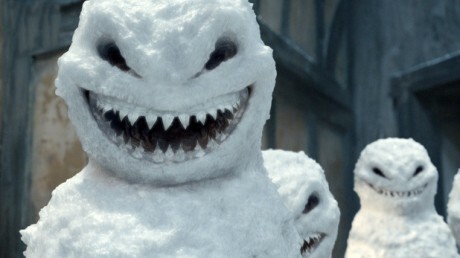 ‘Voyage of the Damned,’ the 2007 Christmas special, is a prime example. From Astrid’s death until the Doctor saves the day, we are treated to dramatic zooms, swelling music, and significant facial expressions, all while the story slips quietly into the background. The episode remains engaging and fun, but it loses a share of its sincerity. Things took a marked turn for the worse with the pairing of Stephen Moffat and Matt Smith. Moffat is a fanboy from the school of thought that all fans are boys. Smith is a young man who still sees women as alien creatures, rather than fellow humans. Together they made television strictly for the most juvenile part of themselves, to the exclusion of any other type of fan. Their work still has merit, in places, but it is marred by their twelve-year-old-boy thinking. Now, Peter Capaldi brings out the best in Stephen Moffat. Not since Series 1, when Eccleston pushed Davies to be his best, has the writing been so consistently strong, with storytelling as its focus. The nerd remains strong in them – the season is peppered with show history – but now the nerd serves the story rather than the other way round. Authenticity matters again. Human beings matter again. We enjoyed our re-watch of the third new-Who Christmas special, but it doesn’t hold a candle to S9. I never understood the average fangirl’s obsession with David Tennant’s hair. While I was amused by its outrageousness, I never saw its appeal to the degree that others – including Rose Tyler – clearly did, and I thought their fascination bordered on creepy. I just want to touch those gorgeous Italian curls. This scene remains one of the highlights of the series. It’s hilarious and tense, the music is great, and the crosscut of cheering kids in the car ahead is one of my all-time favorite Russell moments. Overall, the episode is at the high end of the fun scale – Segways, anyone? – but also has a heavy measure of sincerity. Known for her comedy, Catherine Tate portrays heartbreak with touching authenticity. Her sadness and her wonder ring true, alongside all the humor and shouting. From day one Donna was an authentic human being, and a perfect contradiction for the Doctor. We – and he – were incredibly fortunate to get her back. The episode includes a number of references, both to past and future events. Of course there’s lots of talk of Rose, whose last goodbye has left the Doctor shaken. Her former employer, Henrik’s, appears prominently advertised in the background of Donna’s race across London. Torchwood, the arc of the prior season and the spinoff still to come, owns Donna’s employer, H. C. Clements. The order to fire on the Racnoss ship comes from a Mr. Saxon, the upcoming arc for Series 3. Now, in Rose’s absence, a vindictive streak begins to show in him – a streak that will culminate in his destruction. A good, fun episode with lots of nerdery, a cool and shiny monster, and really excellent performances from our leads. A year ago I would have said it was impossible. Even after S9, amazing as it was, I had my doubts. He’d followed up the 50th anniversary special with the disastrous ‘Time of the Doctor.’ He’d set up ‘Silence in the Library’ with ‘Let’s Kill Hitler’ and ‘The Angels Take Manhattan.’ Moffat’s been good before, but it’s never stopped him also being terrible. But S9 held on to the end. ‘The Husbands of River Song,’ in spite of its title, gives the character the arc she has awaited and deserved since 2008. Way back when the Twelfth Doctor was first cast, it occured to me that this was the man to take River to Darillium. This man had the depth of character, the emotional courage, the grace to see her off properly. But given everything that happened in Matt Smith’s era, I figured that was off the table. I have never been happier to be wrong. This episode is everything I could want from a Christmas special. It’s ridiculous and spectacular, sweet and funny and sad. Twelve’s joy is contagious, the best treat we could ask for. River, when she’s over being campy, is courageous and sincere and – for nearly the first time since the Library – entirely real. This is the River I’ve been missing all these years. It’s strange to think that River could ever have loved or been loved by the Eleventh Doctor. Her chemistry with Ten was undeniable – which of course could be said of just about anyone – but her scenes with his successor lacked any hint of a spark. Now, in a single look Capaldi’s Doctor conveys what Smith’s had failed at for four seasons. This Doctor knows River, loves River. That Doctor was just pretending. One possible explanation is that Matt Smith is just a vastly inferior actor. However, while Capaldi is undeniably a master, Smith is not lacking in skill. I’m not sure it’s entirely his fault that the love story failed to launch. It’s more like both actor and writer had some growing up to do. Working with Capaldi has somehow forced Moffat to move past the twelve-year-old boy and start writing for grownups again. My husband points out that you could look at it as River’s growth and development over the course of her timeline. In the Library, she was as mature as she was going to get; in ‘Let’s Kill Hitler,’ the most puerile. She grew up out of order, from our point of view. We’ve been tolerating her childishness for a long time; now at last she’s the adult we’ve been missing. Whatever it is, I’ll take more. Onward to Series 10! Imagine my delight when my husband announced that he’d like to watch ALL the Christmas specials this year. Two things stood out for me this episode, things characteristic of the RTD era which I find I miss now that he’s gone. One of them is the newscasts. Trinity Wells and her ilk covered no fewer than eight alien incursions on Doctor Who, The Sarah Jane Adventures, and Torchwood over five years of Russell’s reign, lending verisimilitude and a familiar humanity to the events. Of course we’d all watch the Slitheen or the Sycorax on television, as we watched everything from the moon landing to the Challenger disaster to the September 11 attack on New York. The other thing I noticed was the inclusion of small, anonymous moments of humanity. When the Sycorax engage their blood control, one third of the population enters a trance and leaves home to climb the tallest buildings they can reach – many of them families. Early Christmas morning, Rose’s baffled neighbor follows her partner out of the flat and up onto the roof. Nearby, a terrified mother urges her husband and children to respond to her. The tears in her voice break my heart. Many of Moffat’s stories focus closely on our heroes; Russell makes sure we see everyone. We had a great time re-watching this episode. Rose, Mickey, and Jackie are my television family. Harriet Jones is wonderful and terrible. The special effects have aged no better than their forebears on the classic show. Revisiting the Tenth Doctor’s first outing is a delight. Spoilers for S9 follow. Proceed with caution. Many of those fans would prefer to forget he ever said it. It was an American add-on, an attempt to make the Doctor more relatable to xenophobic Yanks, a nod to Spock maybe. It wasn’t the Doctor. But then Russell T. Davies said otherwise: that we can’t ignore the Doctor’s reference to his own humanity. Which he then proceeded to do for five years. He said it, and he dropped it, leaving the question unaddressed. Now, in ‘Hell Bent,’ Lady Me picks it up again. Is the Doctor human? Is he the Hybrid? Is that why he loves the Earth so much he can’t stay away? The Doctor declines to state, but the pot is stirred. For purposes of the story, of course, the Doctor isn’t “the” hybrid. In fact there isn’t really “a” hybrid – it’s the combination of the Doctor and Clara that threatens Time Lord existence somehow. The details are not important – and once again, the question goes unanswered. But one other thing struck us as odd about this episode: the speed with which the General recovered from regeneration. The Doctor spends hours or even days, every time, confused, amniesiac, and otherwise unhinged. The General stands up, brushes herself off, and gets on with her day. The theory my husband proposes is that the Doctor’s human DNA interferes with the regeneration process. He’s enough Time Lord that he can do it, but enough human that he can’t do it well. We haven’t personally seen enough other Time Lord regenerations to make a suitable comparison: just the one above, and the Master in ‘Utopia,’ which doesn’t really count since any regeneration sickness would be indistinguishable from his usual level of lunacy. (Or maybe John Simm’s entire run was recovering from regeneration. That would explain a lot.) But in ‘Destiny of the Daleks,’ I believe, Romana tries on faces and forms like hats, with no apparent ill effect. She has perfect control. The Doctor suffers a “lottery.” (A heavily weighted white male lottery – perhaps an effect of his human inheritance?) No other Time Lord has had the Doctor’s difficulties. On the other hand, River Song is entirely human, and regenerates with no trouble in ‘Let’s Kill Hitler.’ So maybe that’s not it after all. Here’s the full writeup, for interested parties. But I have a better head canon. The Doctor isn’t genetically half human. Instead, perhaps he spent an impressionable portion of his childhood in the care of a human woman – the companion of an adventurous ancestor, perhaps, his predecessor in interference – and she made such an impact that he considered himself part human for her sake. Perhaps his own mother died young, and he put his hearts in this woman’s hands. It would explain his affection for her lineal sisters. It would explain his passion for her home world. It would explain his unwillingness to behave like a proper Time Lord. He knew that something more existed, that other kinds of lives were lived on other kinds of worlds, and he wanted nothing more than to see them for himself. ‘Hell Bent’ ends with Clara and Lady Me flying off to see the universe in a TARDIS with a wonky chameleon circuit. ‘The Name of the Doctor’ proposed that it was Clara who pointed the Doctor in the direction of his eternal friend in the first place. It was suggested on this week’s Fan Show that the two machines are one and the same: Clara returned her TARDIS to Gallifrey, and offered it to the fleeing Doctor. Slight spoilers for S9 to follow. My husband reminds me, at the end of this season, of the props due composer Murray Gold. Gold has written and arranged the music for Doctor Who since its return in 2005. A half dozen* or more albums have been released, and concerts of his work performed on three continents. 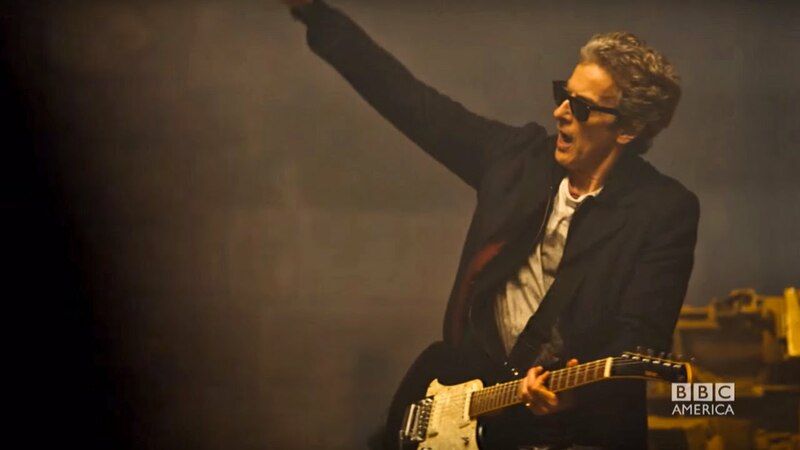 This season, as the Doctor begins making music for himself, Gold gets to stretch a little – and in the finale, bring everything together. Other bits of music, including “Pretty Woman,” “Amazing Grace,” and Beethoven, have also appeared. But in ‘Hell Bent,’ we get a whole assortment of treats. Two of them appear in Clara’s diner: Foxes’ “Don’t Stop Me Now” from ‘Mummy on the Orient Express’ plays over the radio, and the Doctor picks out Murray Gold’s “Clara?” from S7 on his guitar. The other two take place in the Gallifreyan desert. If I knew how to do video capture, you’d have it. It’s awesome. The Twelfth Doctor’s theme, titled “A Good Man?” is another stirring piece of music we’ve been treated to these last two seasons. The S8 soundtrack is available now. I look forward to S9. *ETA closer to ten, actually, depending on where you try to buy them. S1-2, S3, S4, S4 – The Specials, S5, S6, S7, and S8 have all been released, as well as an album of music from ‘A Christmas Carol,’ an album from ‘The Doctor, the Widow, and the Wardrobe’ and ‘Time of the Doctor,’ and theoretically a 50th Anniversary Celebration collection. Their availability varies.